MailStore Home lets you archive your private email from almost any email source and search through them quickly. You will never lose emails again. For home users, emails are also a valuable source of information. A large amount of data and important files is saved in the form of emails. With MailStore Home you can backup all emails in a central archive, even if they are distributed across different computers, programs or mailboxes. You can do this either on your PC or on a USB drive as a “portable” option. Emails can be lost due to incomplete data backup, corrupted PST files or other technical problems. With MailStore Home you will never lose emails again. All archived emails can be restored from the archive at any time using the handy export feature. This also allows MailStore Home to be used to migrate emails. MailStore Home has a powerful full-text search feature that can search through large amounts of data and any type of file attachment extremely fast. Emails can be restored from the archive or just opened in your email client (e.g. Outlook) with a single mouse-click. MailStore Home is even able to manage large amounts of data effortlessly. Now both your past and future emails are safely stored. 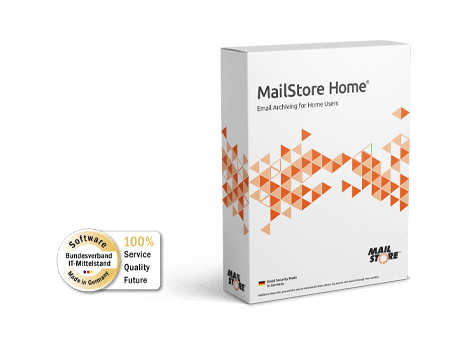 MailStore Home is also available as a “portable” option and can be launched directly from a USB hard drive on any PC without prior installation. If you prefer to use a USB flash drive instead, be sure to use high-quality device.